To add new functionality to existing applications. Simplify enhancing the user interface: Using a set of customizable rules, aXes now takes user interface modernization to a new level of automation and sophistication out-of-the-box. Rules allow you to define how 5250 screen elements should be handled when screens are dynamically converted to web pages. For example, a rule could specify that function keys should be converted to push buttons, page keys to subfile scrollers, how dates should be handled, and much more. 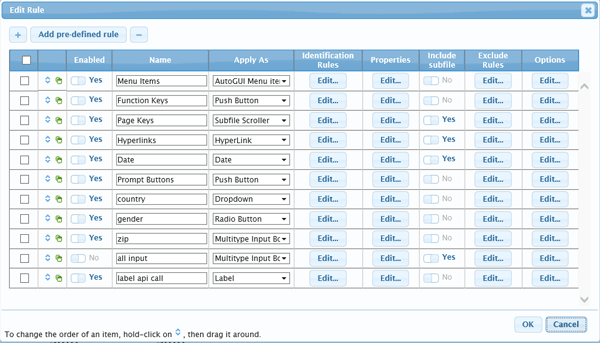 You can enable, disable, edit, create and remove rules to suit your requirements. Rules may apply to all screens, or you can restrict rules to specific screens. See Figure 1 below. How does this help your business? You can implement an enhanced user interface in a very short time with a minimum of effort. Figure 1: Example of a rule list. Optimize Business Processes: Modernizing the user interface is but one aspect of application modernization. By adding process optimization you add productivity improvements and potential cost reductions. aXes includes new features that make it easier for developers to streamline the way business processes operate. Realtime collaboration between the browser and server: A new aXes feature, called WebQueue, enables two-way communication between the IBM i server and the browser. WebQueue is based on web sockets technology and enables the server to send data and notifications to the browser without waiting for a request from the browser. Here's a use example: Suppose a long-running job collates information and ultimately prints a report. Historically, the person who initiated the job would frequently interrupt their work to check the job status. Using WebQueue, the IBM i application can send a notification to the person when the job is completed. To make the process even smoother, the notification can include a PDF copy of the report and/or a file that can be downloaded into Excel. Add new functionality to existing applications: Existing applications are valuable assets and adding new features extends their ability to perform tasks that were not part of the original application. Examples are sending emails, calling IBM i programs from a browser and printing from the browser. All this is now possible with aXes Business Value Services. Sending Emails: Using the aXes Email Service, existing applications can generate and send emails. Employees can compose emails or merge data into predefined email templates, then send the emails without leaving the application. This feature allows the application to log and track all emails related to a business activity. Here's a use example: An IBM i manufacturing system includes an application to build quotations. Historically sales people would fill out the details of the quote, print and scan the quote to create a pdf, open their mail application, create an email, attach the pdf and then send the email. To improve this process, you can now create a quote email template using aXes Email Service. When the quote is ready to send, aXes will merge the details into the template, the sales person will add the recipient and comments, then aXes will send the email without the sales person having to leave the IBM i application. Calling Programs on the IBM i: Typically, web applications running in a browser send requests for resources to the server and the server sends the resources back to the browser. The aXes Program Call Service allows any web application to call IBM i programs directly. The IBM i or aXes administrator can now customize the settings of ‘configuration objects' that control secured access to IBM i programs. Web applications invoke a configuration object that in turn calls the IBM i program, hiding the name of the called program and maintaining security. Here's a use example: Your IBM i application can process orders that were entered by data entry staff. You want customers to be able to use a web application to place orders. 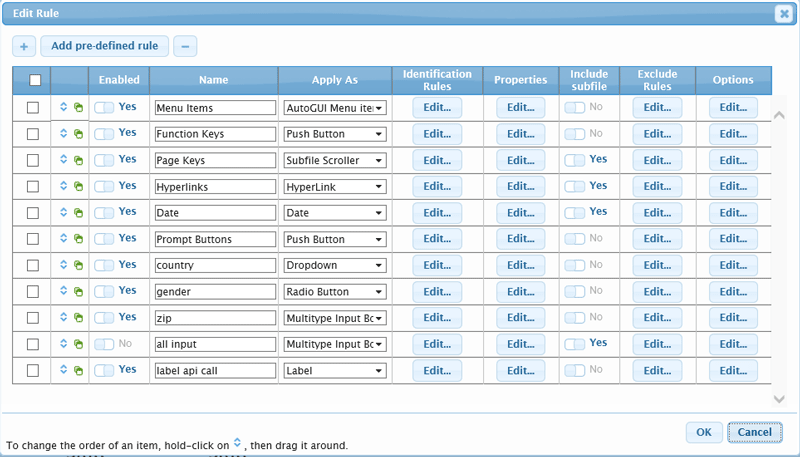 The difficult question is how to insert orders from the web application into the existing order processing. You can now use the aXes Program Call Service to call a program on the server and send it the order data from the web application. Here's a use example: Suppose you want to take invoice details from an IBM i spooled file and print an invoice, adding details that do not appear in the spooled file, e.g. a company logo. Another example is printing a receipt for an online order. The aXes Browser Print Service will print the page exactly as you defined the layout. More details about aXes Version 4 and instructions on how to download a free trial of aXes can be found at www.axeslive.com.